If you follow me on Instagram you probably read that I am currently obsessed with anything chamomile in my skincare. However, I am not new to the benefits of chamomile. My mother introduced me to chamomile many years ago. Whenever I would start to stress about my next University exam, she would make me a cup of chamomile tea and give me a chocolate bar (I would ask for chocolate, not for tea, but okay). Chamomile has calming properties that not only help us to relax, but also sooth our skin and heal it (among the many other health benefits that are still being studied). With all of that said, I believe that these two Chamomile-based products that I have been loving lately will benefit most of you all with sensitive skin. 1. YULI Cocoon Elixir, (find here). A gentle face mist that hydrates the skin and immediately soothes it. It contains not only German Chamomile hydrosol (hydrosol is the by-product of steam distilling plants), which helps to relieve any irritations and redness (I often get some redness on my cheeks); but also contains other powerful, active nutrients like Calendula, Rose Otto, and Acerola. The base of the product is aloe vera, which by itself is very hydrating and healing. This face mist is perfect for sensitive skin, but I think that it would work for any skin type. I have combination skin (oily T-zone, otherwise normal, but often irritated on my cheeks) and this mist does not make my T-zone greasy at all, but instead balances it. It gives a great boost of moisture and feels immediately soothing and balancing. Chamomile is also anti-inflammatory, so it helps with any skin irritation and I find that it helps to heal occasional breakouts as well (it has been successfully used to promote wound-healing in several studies). 2. Odacité Pure Elements Camelina Chamomile Serum Concentrate*, (find here). A very concentrated serum that contains two active, effective, and skin-soothing ingredients. The first one is cold-pressed, certified, virgin Camelina seed oil; which conditions irritated and reactive skin, and it is also known to help treat eczema. The other active ingredient is German Chamomile, which helps to calm the skin and to minimize the redness. Every night I apply only two drops of this serum to the area of my face that usually show signs of sensitivity and irritation (mostly, my cheeks) while my skin is still damp from spritzing the Cocoon Elixir. Then I gently pat the serum into my skin until it is almost completely absorbed. I find that it helps tremendously with calming the redness. It doesn’t hurt that it also smells wonderful. Just a quick note about the Odacité Pure Elements Serum Concentrates. These are concentrated serums that target specific skin concerns so that you can directly treat problem areas (such as oily skin, congested pores, deep fine lines). They are particularly helpful and beneficial if you have combination skin, (the most common skin type, apparently), because you can apply a balancing serum on your oily areas and a more hydrating booster on the driest areas of your face. 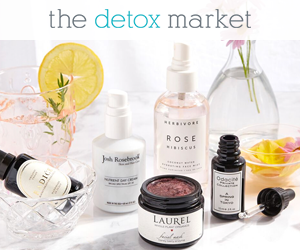 I love the concept behind this collection and the Camelina + Chamomile serum has been working very well for me, so I plan to try the booster for clogged pores next! My skin has been much more clear since I have introduced the Cocoon Elixir and the Odacité Camelina Chamomile serum into my routine (together with a cleanser that I will blog about soon), so I am now a firm believer that Chamomile based products are very effective at protecting and healing the skin. Lastly, I just wanted to share a quick, old school method to de-puff your eyes. I learned this in my partying years when I would go out, yet had to go to University the next day (I don’t miss those days a single bit!). Place two bags of chamomile tea in hot water for about five minutes, then let them cool off until they are no longer hot and are comfortable to be placed over your eyes. Let them sit on your eyes for fifteen minutes, but make sure not to get any liquid in your eyes. They will soothe your eyes and de-puff them. Let me say again, make sure that the bags are cool enough to place on your eyes without burning those sensitive eyelids! If you have sensitive skin, I highly recommend trying some Chamomile-based, skincare products. You can find the YULI Cocoon Elixir here. and the Chamomile Concentrate Serum here. 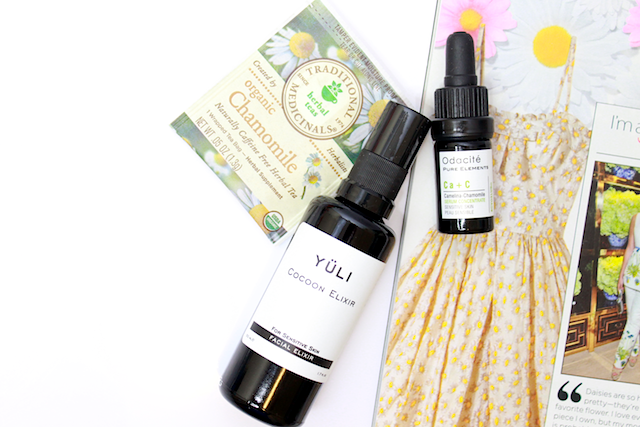 Have you tried any products with Chamomile? If so, which ones? Tell me more in the comment section below.